The Challenge Spartan 185 Paper Cutter is available in 3 different models, 185-SA Semi-Automatic, Spartan 185-A Automatic, and 185-AEP Programmable. The 18-1/2″ cut width provides an economical solution for lower volume cutting environments such as professional offices, copy centers, in-plant printers, and on-demand digital print providers. 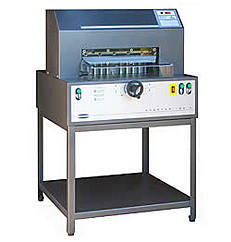 The Challenge Spartan 185SA paper cutter is a manual hand wheel operation with a manual back gauge control. The Spartan 185 SA has a twelve red LED digital back gauge position indicator positioned over the knife which provides the brightest optical cut line in the industry allowing for easier operator interface, higher productivity, and easier repeatable accuracy than a hard to read indicator. There is an auto releasing front safety shield that automatically pops open after a cut cycle is completed allowing the operator to remove the cut stock with the extra step of having to manually open the cover. The Spartan 185SA requires no maintenance, the knife bar gibs are made out of an advanced material called UHMW which is both strong and self-lubricating. The Challenge Spartan 185A is a semi-automatic cutter with a digital display and offers the same features as the Spartan 185SA with the addition of an automatic paper clamp. The electric powered clamp generates over 3,000 pounds of clamping force and the ability to have an independent clamping function for “clamp only” operation. The Challenge Spartan 185AEP is fully automatic and offers the same features as the Spartan 185SA and the 185A with the addition of a 3” lighted LCD display that operates an electric powered back gauge with programmable memory. All of the Spartan models feature electric powered cutting, a laser red LED cut line light, a two hand push button controls, front and rear table safety shields, automatic releasing for the front safety shield which automatically pops open after each cut cycle is completed, requires zero maintenance and have lifetime durability! If you have any questions or are interested in purchasing the Challenge Spartan 185 Series Cutter, visit us at SpiralBinding.com. We also have great pricing on a full line of Electric Paper Cutters. Call us at 1-800-631-3572 for more information.